Almost 20 years ago, my friend came visiting with her older cousin. We had a great time talking, eating, and laughing until tears streamed down our faces. Her cousin Em, had great stories, and told them with such humour! Cousin Em was a lot older than us. She was in her forties, very well traveled, very well spoken and extremely down to earth. She felt at home in our student flat and ate whatever we gave her in our chipped mismatched student plates and enjoyed it too! It was such a shame when she had to go home; we wanted to freeze the moment and keep her with us forever! We asked her to spend the night. See, in my student days my flat was the flat to which everyone came and went and spent endless nights. I was so sure that it was a given that my friend’s cousin would spend the night. That was her reason. It was funny and we all laughed. I wanted to offer her my cocoa butter and Superdrug brand face wash, but suddenly, I knew they were inadequate. It was a shame to see her leave in the wee hours of the morning, but still, we have the memories. Fast forward to twenty years later. Me. This morning as I get ready for work, I’m startled by my rich array of creams and potions. 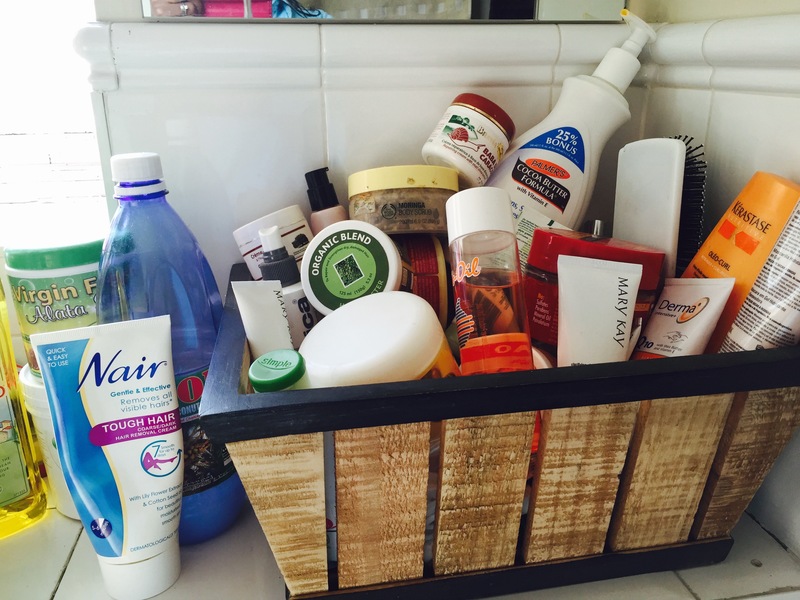 The bathroom counter is spilling over with all sorts: hair creams, hair sprays, body creams, face creams, blemish removal creams, hair removal creams, hair growth creams….all sorts! I have never really classed myself as vain, but recently I bought a cream that promised to rid me of the stretch marks that I acquired in my teen years. I have no idea why I bought it because I never believed for a second that it could do what it promised to do on the jar. But I guess I thought I had nothing to lose. The magic ingredient in this particular potion is snail slime. Yes, I know. Whatever you think, trust me when I say that my mother’s voice in my head has said it to me; not once, not twice. And it has also said worse. Snail slime. And I really ought to know better too. And I promise that I do know better. But, I bought it, so I am using it. It has an accompanying soap. Yes it’s made out of snail slime as well, but surprisingly they smell really good. The soap has a really rich lather and is actually quite refreshing. The body cream is not heavy; it is kind of light for a moisturiser but I mix it with other thicker moisturisers. These snail slime products claim to heal all: wrinkles, stretch marks and all sorts of blemishes; well, unless you’re allergic to snail slime and then you’re really buggered! The next question on your mind of course is ‘how do you know if you’re allergic to snail slime?’ I mean it’s not like people routinely find snails and rub their slime on their bodies….your guess is as good as mine! Well, I’ve been using it for about 3 weeks now. And of course the marks are still there. But I’m still shovelling it onto my skin and smelling like it everywhere I go. On the train this morning, a guy attempted to flirt and said ‘you smell nice’. I had to bite my tongue because I almost replied ‘Yes, it’s snail slime’. He was lucky I was wearing my snakeskin shoes instead of my snake hair oil. Because if he thought snail slime smelt nice, he would have been bagging a real winner with snake oil! I mean, he’d have been mesmerised. He was as slimy as actual snail slime too, so instead, I smiled and kept walking down the platform. Wouldn’t want him to have smelt the macadamia oil in my hair, because that actually smells pretty good! I am not sure what compels me to buy this stuff. Most of it doesn’t even work. But I am guessing that it is the human spirit of hope. We all need hope just to get out of bed and look at ourselves in the mirror each morning. I know that my hope is being geared towards having perfect skin (which in reality will never really happen), but it is hope nevertheless. I celebrate my vanity, I celebrate my hope, I celebrate getting older….and I celebrate the fact that I will be saving a few pennies when I stop looking for the magic potion when I’m 200. The truth is, I don’t necessarily want to live until I’m 200; but if I do, I’d rather not look like it!